At around 231 million percent, Zimbabwe’s hyperinflation (which we’ve written about before) is currently the highest in the world. But is it cost-effective for Zimbabweans to use money instead of T.P.? A roll of toilet paper costs about $1.50 U.S. dollars and has about 352 sheets per roll. That means each sheet is worth about US $.004, or 3,600 Zimbabwe dollars, according to OANDA.com. So according to these calculations, using a ZWD 1,000 note in place of a piece of toilet paper is a wise financial decision. Yes, but I'd want to wash that money before using it for any body-cleaning purpose. "Filthy lucre" really is filthy. For what its worth, I did not intend my comment above as such an insult. The USA Today is arguably a more economical substitute: it's cheaper and the opportunity cost of using it as toilet paper is also lower. However, I don't entirely trust the fastness of all of those brightly-colored graphics so I can't in good faith recommend it. Am I the only economics graduate around who places a high value on the quality of my toilet paper? Maybe it's because the stuff at my school was so terrible. Really, newspaper would have been an improvement on that. If enough ZWD's were used in place of toilet paper, could that destroy enough of the money supply to bring hyperinflation under control? Or would it just reach equilibrium at TP = ZWD? maybe i'm missing something, but isn't it presumptuous to think africans are paying USD1.50 per roll and then drawing a conclusion from there? i mean, unless you're thinking of american tourists who bring their own toilet rolls to africa, and just happen to have some ZIM$ weighing them down. then they mull over the math as they're "doing it", and decide its cheaper. for example, a dozen good rolls in Malaysia costs about RM8.00, or USD2.20 thereabouts = USD0.18 per roll. i'm not negating the novelty or significance of the article or sign. i'm just saying if you wanna do the math to figure it out, set practical assumptions. 2. south africans who DO try to change the money back are disgusted by how much they've lost in exchange over just a few days, thus in both cases decide it's then worthless to even bother - hence just using it for toilet paper after. Amazing... it's like the baking soda of commerce. Zim money is a novelty in South Africa - people who have them and pull them out in public are generally only doing so because it's amazing to see and a great conversation topic and generally a good joke... it's even more novel than Monopoly money. Another point worth mentioning... Zim money is also a novelty in Zimbabwe... they can't draw enough money out of the bank to pay for a loaf of bread let alone anything else that may actually be available. The currency of Zim right now... what you can give me in return... kinda like a barter economy with some US dollars thrown in the mix. Oil/petrol is a particularly common price to pay for something there from what I have read. Now onto the specific example... since the toilet is of origin RSA (same as me! ), you can expect that public toilet tp is probably sold at around R2 per roll (a guess... I pay R30 - R40 for a 9 pack of 2 ply... that is not what can be expected at a public toilet), so conversion at around R10 to the dollar means that we're looking at a cost of 20 US cents per roll of toilet paper which is about, with rolls of 352 sheets (although I think they may be a bit smaller here... more like 100 to 200) you're looking at 0.057 cents per sheet of toilet paper - a bit cheaper than above (the equivalent of about 880.787 Zim dollars) making it still cost effective. In Zimbabwe itself this is probably even more of a case as I would suggest that the supply of toilet paper is severly low (like only very rich people with connections in the black market have access to) and not a priority supply of aid agencies who are fighting a worsening battle, perhaps it would be beneficial to the Zimbabwean economy to replace their currency with sheets of toilet paper! (okay incredibly frivolous and flawed... so please just take it as tongue in cheek!) Finally... as I say... I do not know about the actual supply, I am just making a suggestion based on everything I hear about supplies of anything in Zimbabwe! The Zimbabwe 100 billion dollar notes are going for 5 USD on Ebay. (Zimbabwe dropped 10 zeros in August 1, 2008 but it hasn't helped quell inflation). If you bought one and asked for change in 1000 ZD notes, they would stack 10 kilometers high. These would be an excellent energy source to burn in power plants. As a Zimbabwean in Zimbabwe, I think you should do some research before submitting some of these comments...and yes we have internet connection in zim, electricity...sometimes...and no money :( please pray for my country though, we need it! LOL wonderful repose. that's the whole point of comments isn't it, to figure it out? If it's not cost effective now, it will be in like 15 minutes. 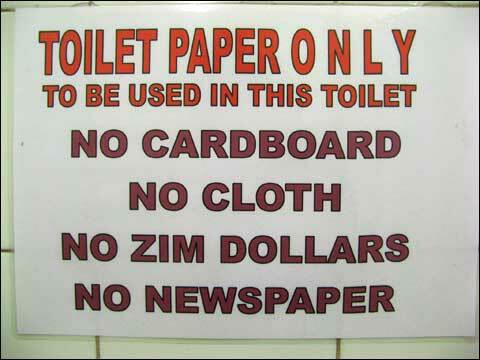 Why there is also "no cardboard", "no cloth" and "no newspaper" in the notice along with "no zim dollars"? Does it mean people have used all four types of items as toilet paper? 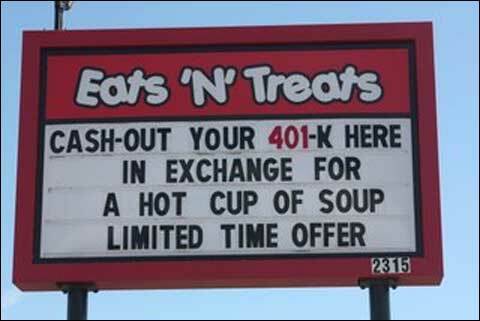 English Bob: a 401K is a tax free retirement investment account. « Previous PostIt’s the Internet, Dad!